NGC 3344 is an excellent example of a face-on spiral galaxy. Its orientation allows astronomers to easily study the structure of its spiral arms. NGC 3344 also displays a subtle central bar. This is a common feature in spiral galaxies with about two thirds of galaxies displaying a central bar. Astronomers believe that our own Milky Way galaxy is a barred spiral galaxy itself. NGC 3344 is a tricky photographic target, as it is fairly small - it only subtends about 7 arc minutes. It also has a subtle halo, which I was happy to be able to capture in this image. The image also shows a plethora of background galaxies - careful examination of the high resolution image will reveal over 35 of these "faint fuzzies". In this photo, North is Up. This image is cropped to 76% of the original full frame. 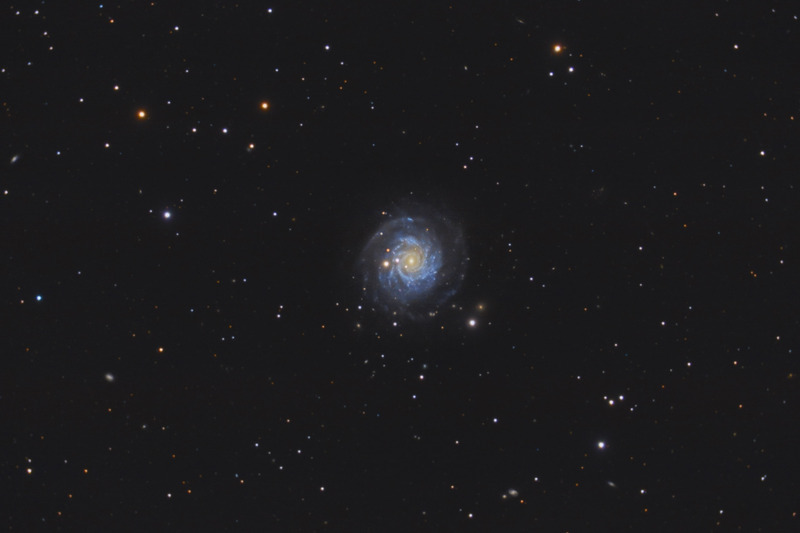 Software Used Images Plus 5.0 for camera control, calibration, stacking, digital development, star shrinking and halo reduction, smoothing and noise reduction, advanced Lucy-Richardson deconvolution, and multiresolution sharpening. Photoshop CS5 used for levels and curves, high pass filter, star shrinking, screen mask invert, lab color, saturation adjustments, selective color, vibrance, match color, and smart sharpen. Gradient Xterminator for gradient removal. Carboni Tools for additional noise reduction, and smoothing. HLVG for additional color correction. Registar for aligning stacks and composites and for color channel alignment. Focus Magic for focus restoration. Notes On the same night that I was capturing this image with my C-8, my friend Bruce Bartle was at Mt. Lemmon Sky Center with Adam Block capturing the same galaxy. The big difference was that Bruce was using the 32 inch Schulman Ritchey–Chrétien telescope! Bruce had generously invited me to join him, but I couldn't break away. At least I was able to enjoy an excellent night of imaging - as did Bruce. While I'm sure that Bruce will end up with a much better image, I was happy to co-capture this beautiful galaxy.